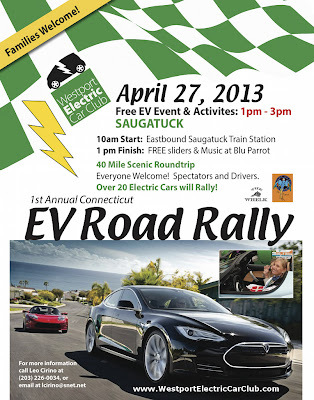 Westport Electric Car Club EV Road Rally will take place on Saturday, April 27th, 10 am to 3 pm. Press Conference and Winner Circle held at 1:30pm, outside Blu Parrot restaurant. The rally will start 10 am at the eastbound side of the Saugatuck Railroad Station (charging stations) with coffee to be provided for all who come. 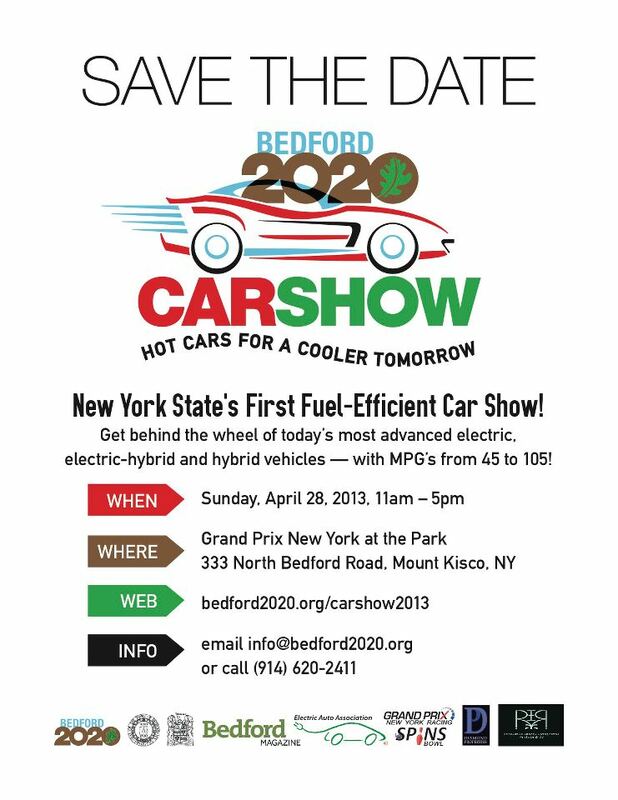 The entrants must be plug-in hybrid or all electric vehicles and will leave for a designated 40 mile course. It will be a Time, Speed, Distance (TSD) rally. This video on YouTube explains. The cars will complete their rally run at the Westbound side of the Saugatuck Railroad parking lot at which time awards will be presented to the winners. To complete the festivities, a barbecue will be hosted by the Blu Parrot Restaurant with music and free sliders for all, from 1pm to 3 pm. Auto dealers will have their electric vehicles for all to see. 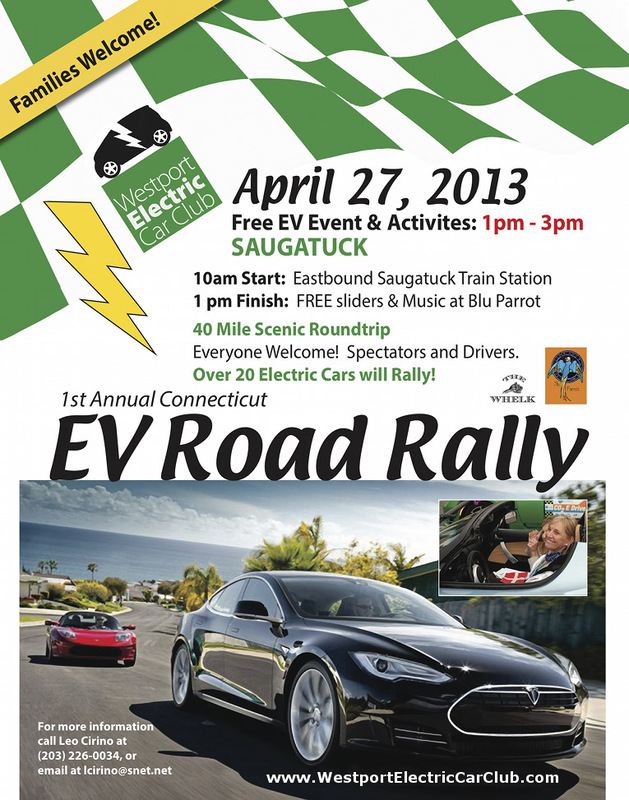 Come join in for an exciting electric car event in Westport. Read more about the rally from Jim Motavalli's Green Wheels. Photos from the rally posted in the Electrifying Times website. 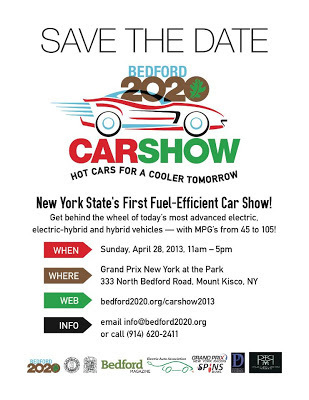 Next day, April 28, attend the Bedford 2020 Car Show! Rally Driving Based on the South Coast in Chichester, West Sussex, Forster Racing School is the fastest rally school in the UK. Run by British Motorsport Rallycross Champion, Leo Forster, the race driving school hosts unrivalled rally driving days and rally driving experiences. This Car DVD Player could bring entertainment while driving even in traffic.Much better to have this to prevent annoyance while we are in driving.Thanks for sharing, this useful ideas.It could really help it to all of us. This In Car DVD Player really works to be entertained while on the road. Such a cool gadget to have! Nice. The event for 2016 is on May 1. I did not know that Ford and Chevrolet has EV cars. I don't see charging stations here, maybe that's the reason they are not available. Relating to cars, I work for Foster Insurance and they are awesome! Learn more about your options when it comes to car insurance in Leominster MA and request a free quote.